Our newest unit can be used for couples or families. 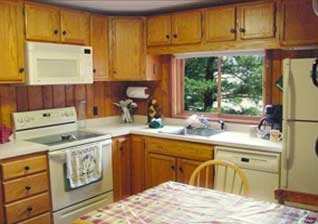 There is a 2-3 night minimum stay for this property. 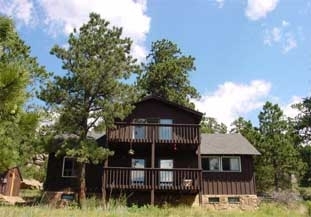 It is located in the McGregor Ranch area with awesome views of the Mountain Ranges that surround Estes Park. It is also within hiking distance to Gem Lake and Twin Owls. 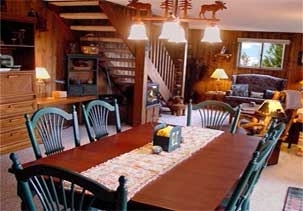 This cabin has three bedroom ( one King,one Queen, one Full) The second story has bunk beds and two Queen sleeper sofas along with a TV/Vcr Combo. 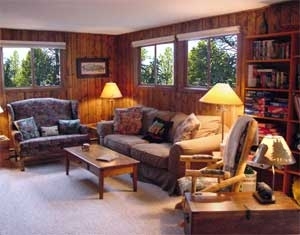 The livingroom also has a Queen sleeper sofa along with Direct TV and a DVD and VCR. There is a Radio/Tape and C.D. Player with C.D. 's for your enjoyment. There is one full bath that includes a victorian tub/shower combination and one 3/4 bath with shower which also has a washer and dryer. The kitchen is complete, including a dishwasher. 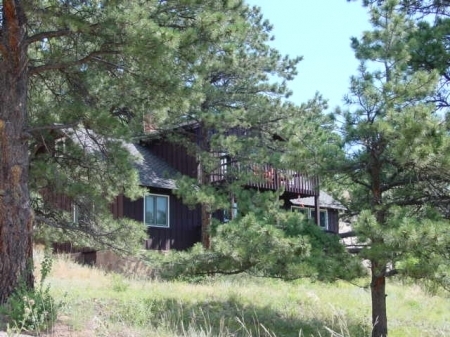 This two story cabin has decks on each level with patio furniture for your enjoyment...... along with peaceful views of the Mountains. An outdoor fire pit and patio tables/chairs complete the back yard. There is also an RV pad with a 50 amp service that can be rented at the same time.This cabin does not have a hot tub but the views are SPECTACULAR and you can hike right from your back door!! Hi Speed Internet Access as of July 2006!! 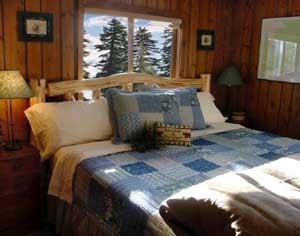 Holidays are at Summer Rate and 3 night minimum. If you would like to make a reservation the information we need from you are your names, mailing address, phone number, and a credit card number. An equivalent of One nights stay will be charged to your credit card at the time the reservation is made. Please do not give out your credit card number over the internet, please call us instead. The balance of your reservation can be paid by cash, check or credit card. (MC, Visa, Discover) at the time of your arrival. After making your reservation we will send you a confirmation with the dates and the unit you have reserved, plus directions on how to get here. If you should cancel 30 days or less before your check in date you will be held responsible for the cost of the rental -unless we can re-rent the unit There is a cancellation fee of $25.00 for any cancellation no matter what the time frame is. Every effort will be made to re-book the unit and you will be responsible only for the nights that we were unable to rebook plus the cancellation fee. All cancellations must be made by phone -CANCELLATIONS PER EMAIL WILL NOT BE ACCEPTED! If you leave a voice mail on our phone we will return your call to verify that we have received your cancellation request. There is no refund for unused accommadations due to late arrival or early departure. Please keep in mind.... This is a family owned business.